Sardar Hammad is sole owner of business. He has been started business since 1990. Following are transaction for the month of August 2016, prepare Journal Entry, General Ledgers and Trial Balance. Aug 3. Reinvestment in the shape of Cash $80,000 and Furniture $20,000. Aug 5. Cash Sales $10,000 and on account Sales $12,000. Aug 6. Bought goods from Ahmed Co. $60,000 paid $15,000 cash and remaining Note payable pay within 30 days. Aug 9. 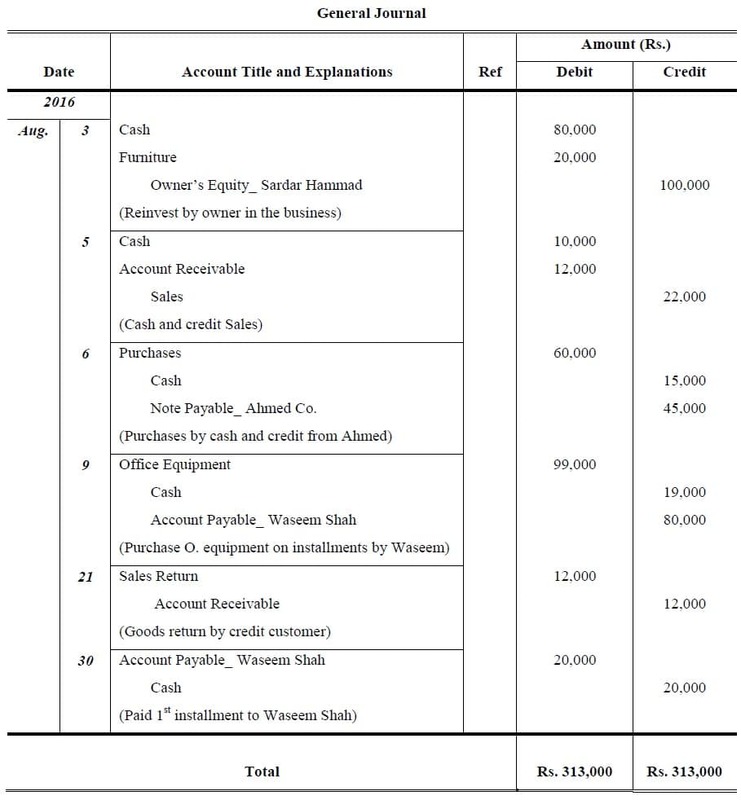 Purchase Office Equipment from Waseem Shah worth Rupees $99,000, a cash down payment of $19,000 and balance will be paid by four installments, first due on 30 August. Aug 21. Goods return by credit customer of worth $12,000. Aug 30. Paid first installment of $20,000. >>> Practice General Ledger Problems and Solutions. Rameesha Hafeez & Co. is a boat repair yard. During August 2015, its transactions included the following. You are required to pass Journal Entry, prepare General Ledger (Running Balance) and Trial Balance. August 3. 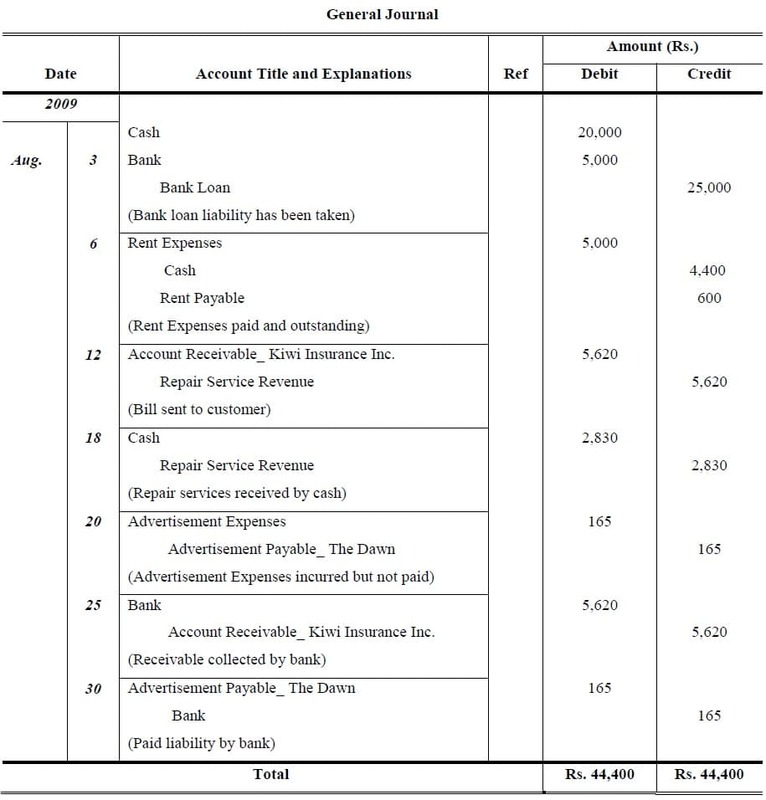 Loan taken from Habib Bank Ltd. of $25,000. $20,000 withdrawn for business and remaining in the bank account. August 6. Paid rent for the month of August $4,400 and accrued rent expenses was $600. August 12. At request of Kiwi Insurance, Inc, made repairs on boat of Jon Seaways. Sent bill for $5,620 for services rendered to Kiwi Insurance Inc. (credit Repair Service Revenue). August 18. Made repairs to boat of Dennis Copper and collected in full the charge of $2,830. August 20. Placed Advertisement in The Dawn at a cost of $165, payment to be made within 30 days. August 25. Received a check for $5,620 from Kiwi Insurance Inc representing collection of the receivable of August 12. August 30. Sent check to The Dawn in payment of the liability incurred on August 20. Spot on with this write-up, I absolutely believe that this web site needs a lot more attention. I’ll probably be back again to read through more, thanks for the info!